A handshake, two minutes of conversation enough to realize that dream when he claimed a pension lying in a hammock, watch a small herd of cows in the river Arauca, Hugo Chavez lying. Venezuela’s President was a politician active 24 hours on 24. He had the « Bolivarian revolution » for the sole purpose of his life, with all that implies: idealism full of contradictions, an absolute radicalism against his opponents, a dangerous certainty to be indispensable and solitary exercise power. « Chavez is a politician to 150%. Nobody can blame him for not having given body and soul to country. Even those who hate acknowledge, and that is also why they hate him so much « explained a close associate of the deceased president. In fourteen years in power, Chavez has always been omnipresent. He slept little. He did not leave on vacation. He made few visits abroad. « Today, I will talk about shortly. Only four hours, » he joked on television in 2009, while he was at the height of his exuberant presidency. Four hours were transformed easily into seven or eight. Without teleprompter, without commercial break. His voice became a little background music of Venezuela. His face adorned the walls of the most remote villages. His image was embedded almost tattooed in the daily life of Venezuela. His name was constantly mentioned either in the bakery, in the subway or in the elevator. The president was the main character and the actor almost unique political life. Chavismo, it was him. Life in Venezuela could quickly turn to the overdose of Chavez. Chavez, who was not punctual nature, broke into the room of press conferences, with the aplomb of those who know they are expected by the door to the right of the portrait of his master, the liberator Simon Bolivar. A shiver of fear and reverence traveled while government members present. Even his harshest critics and most critical journalists admit it: when was facing him, his charisma was unmatched. It was impressive. He could even look nice. « Hey, guys, you have to eat? » joked the president as an introduction with a broad smile. Then the sigh of relief was almost audible side of Ministers: the « head », as many called it, seemed in a good mood that day. He would often wake his ministers in the middle of the night because he had an idea. He publicly humiliated when they did not provide an answer to a problem. He gave them the feeling of being part of a big project, but he did not fail to remind them of the occasion, they were nothing. Loves and misfortunes of the president were capricious and difficult to collect. « When you work with a leader as exceptional as Chavez, you know that your project is a project. Endpoint. Individual plans have no place here, » summarized a government. Entangled in its profound contradictions until the end of his life, Chavez could perfectly handle his political opponent of « pig » before calling for national reconciliation in hell before Obama send to him: « I want to be your friend « denounce the terrible plots against his person and chain singing a joyful song peasant. After that, everything went on as before. Beyond the tropical truculent leader that many wanted to see him, Chavez hiding a remarkable computing power, coupled with an almost animal instinct to detect opportunities and survive failures. Its fuel, it was almost mystical communion with the hundreds of thousands of Venezuelans who asked him to never leave. The adoration he aroused in half the country was proportional to the hatred and anxiety it generated in the other half. 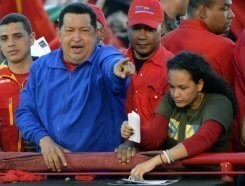 The latter, Chavez despised and treated mercilessly « anti-revolutionary ». « My life is yours! » proclaimed president during these meetings massive, wacky, which exceeded the understanding for the newcomer to Venezuela. Transported by the project, hypnotized by socialism learned from books, Chavez seemed to live alone in a parallel world. He realized, sometimes. The former Minister Carlos Genatios, passed since the opposition, and remembers one day have found mine dark Chavez in the presidential palace and asking him what was wrong. « Here, people do not talk to me, they do not dare, they tell me nothing, » he replied. Know who is hiding behind the « commander » was a challenge. Democrat or tyrant? XXI century socialist or opportunist? Obsessed with power or idealistic convinced of his mission? Or was it all at once? « They make one that Chavez has nothing to do with me, » warned the president one day. On rare occasions, his inner self seemed to surface so fleeting. When he learned that a young woman had given birth in the street because no hospital wanted her, or that supermarkets lacked victuals, or when daggers look a journalist who had ventured to ask an embarrassing question. Even in death, Chavez surprised. Although expected, his death still seems unreal to 29 million Venezuelans. Perhaps death she footed the president himself, unable to resign down the difficult path between the apotheosis of deathbed. « The worst case scenario is that Chavez dies, because we want to win », said Ramon Guillermo Aveledo, coordinator of the MUD, the opposition bloc. Long, opponents have not been able to find a way to exist against Chavez. It is as if, by dying, Chavez exauçait intimate his wish to perpetuate in power and history.